Higher data usage mode: Magnified images are curently set to load all at once - this will give the best viewing experience, but may use more data. You can change this setting in the "Modules" menu, or here. 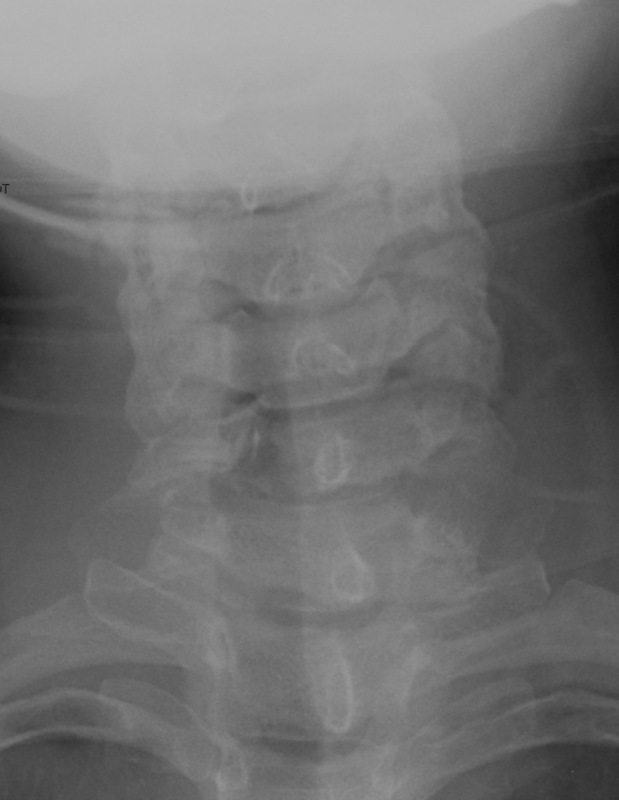 Fractures of C5/C6 are most common. This is because most injuries are due to hyperflexion, with the maximum force being focused upon the vertebral bodies of C4-C7. 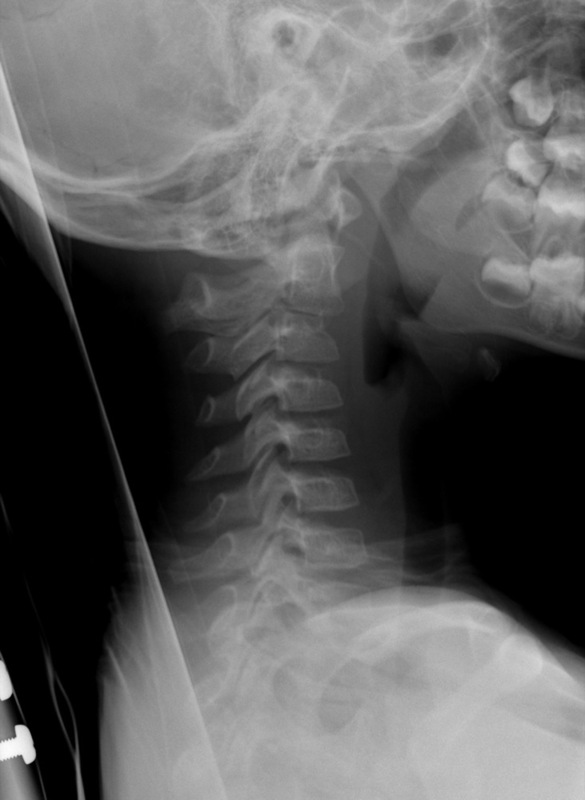 In children under 8 years, fractures are infrequent. If they do occur, they are likely to involve C1/C2. 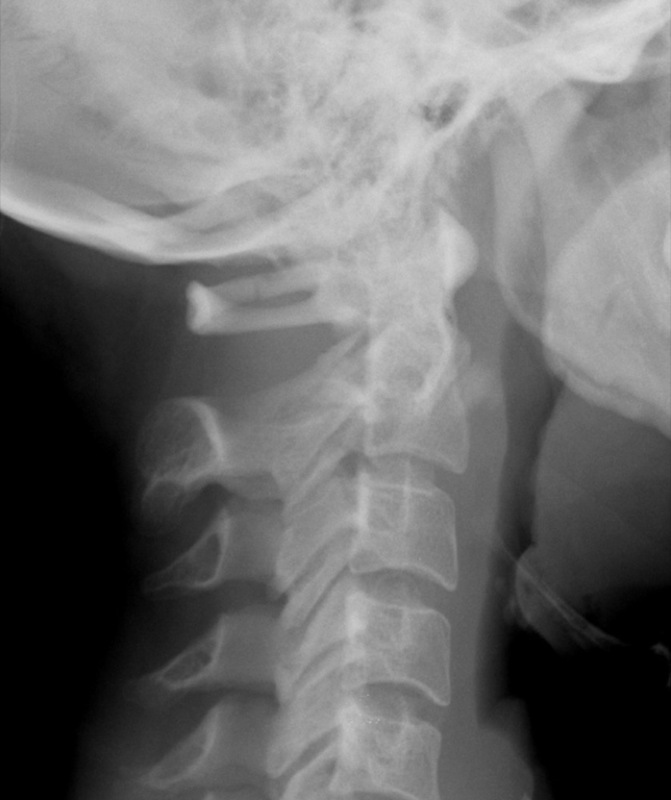 Injuries of the cervical spine produce neurological damage in approximately 40% of cases. 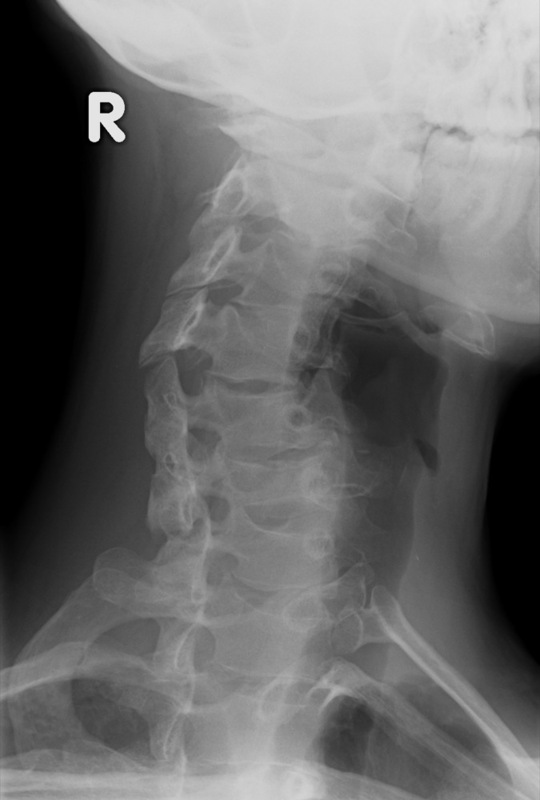 Due to burst fractures or facet joint dislocations. 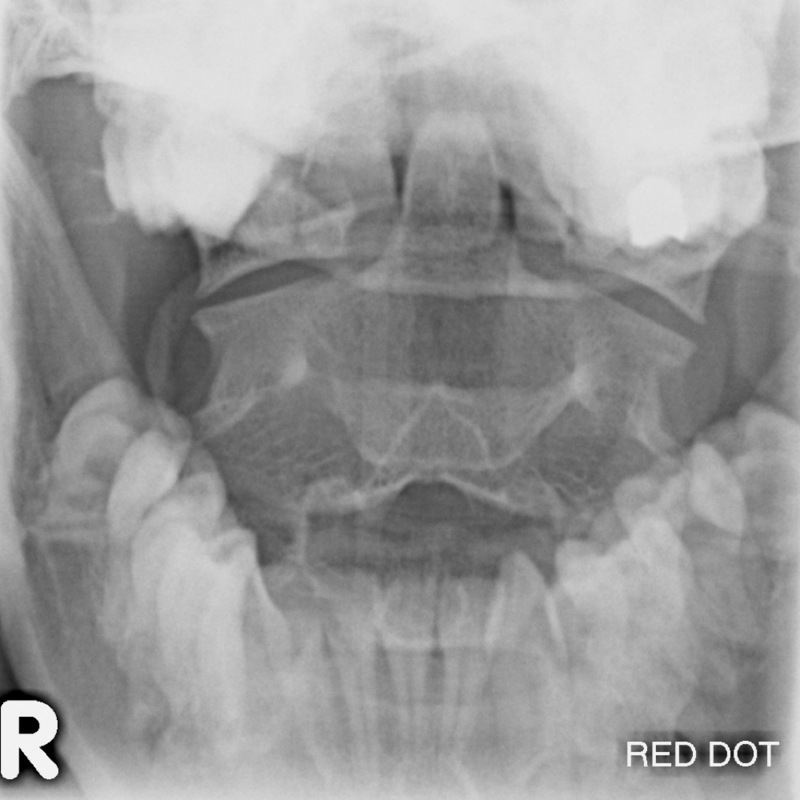 The majority of detectable abnormalities will be visible on the lateral radiograph. Alignment of C7 with T1 must be demonstrated. If not on the initial lateral, a swimmer's view or trauma obliques will demonstrate this area. 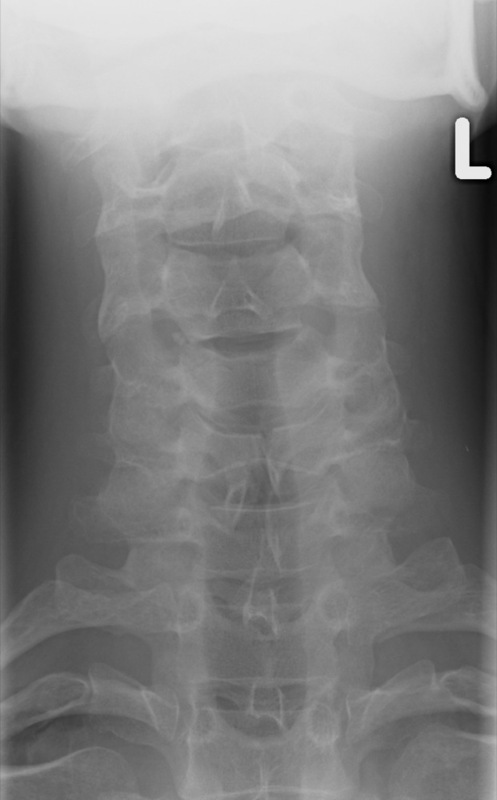 The vertebral bodies and intervertebral discs should be of uniform height. 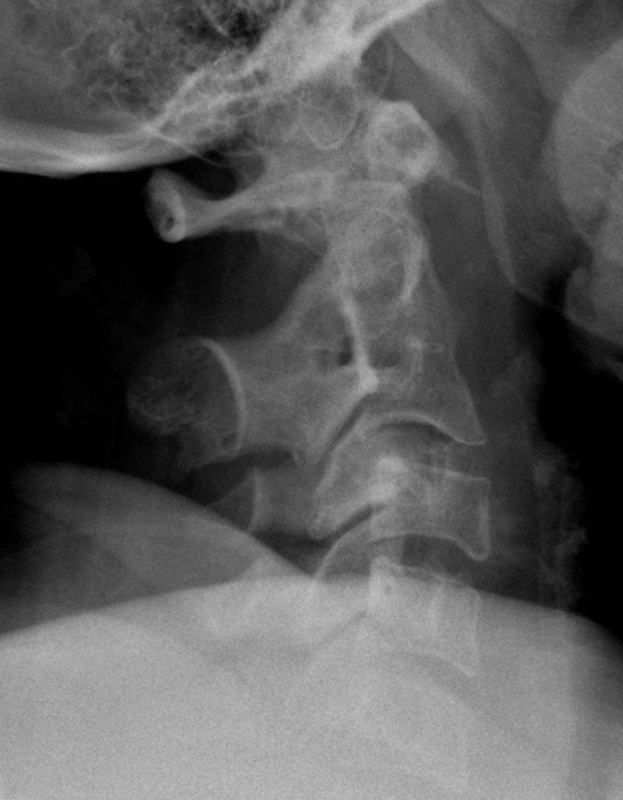 If the anterior height of a vertebral body is 3mm or more less than the posterior height, this is evidence of a wedge-compression fracture. 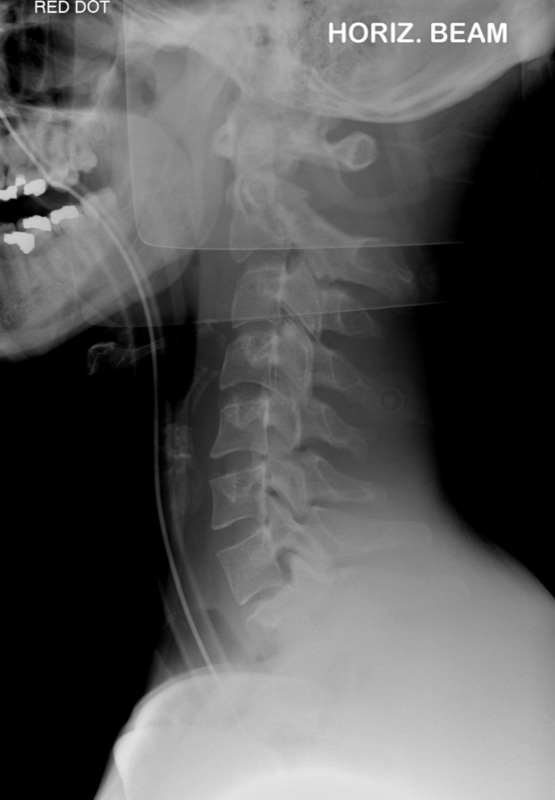 The distance between the posterior aspect of the arch of C1 and the anterior aspect of the odontoid peg should be no more than 3mm in adults and 5mm in children. 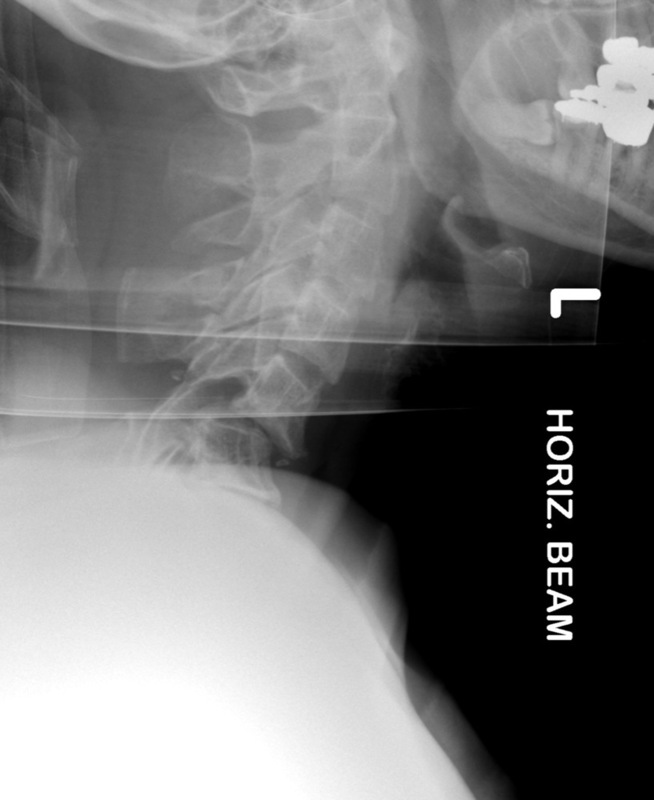 Assess Harris' ring at the base of C2, overlying the vertebral body. This should remain unbroken anteriorly, posteriorly and superiorly. 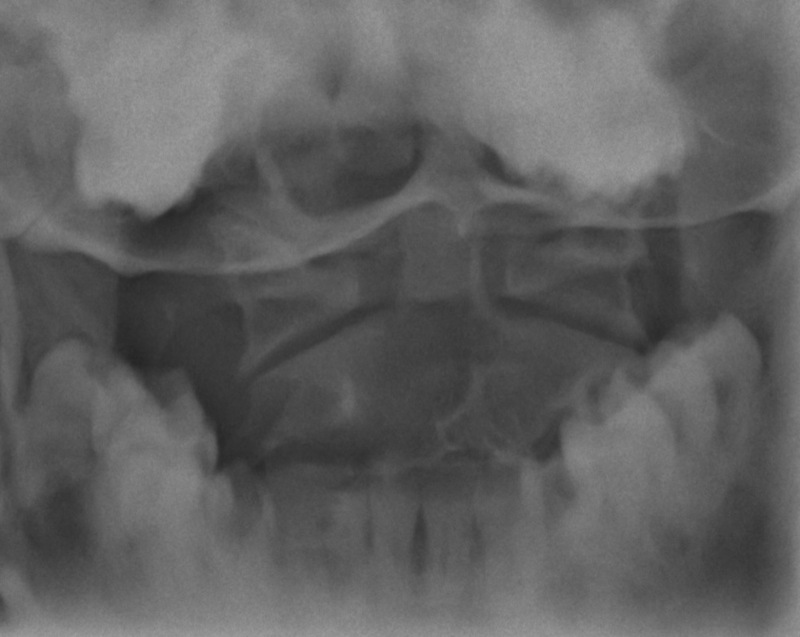 Although the ligaments aren't demonstrated radiographically, clues to their disruption lie in the alignment and location of the osseous structures supported by the ligaments. 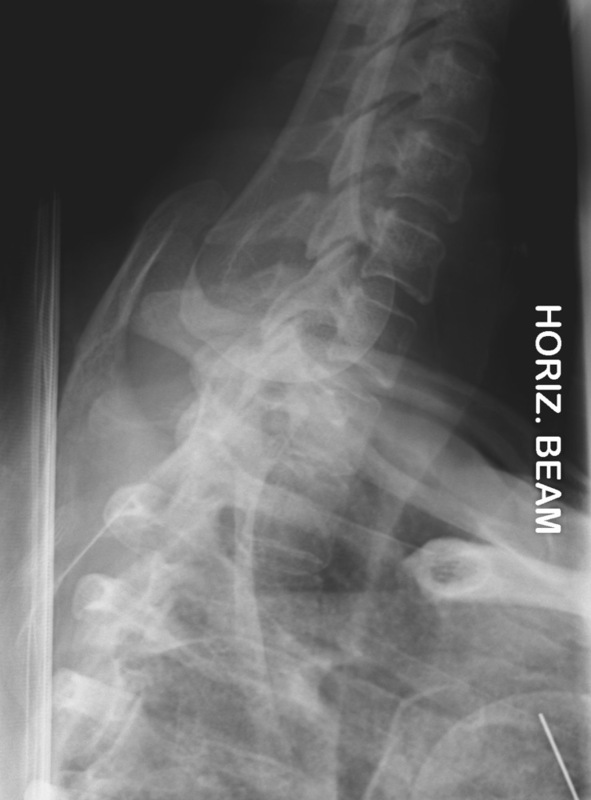 Intervertebral foramina, and the presence of osteophyte encroachment in spondylosis (OA). Alignment of C7 with T1 if the swimmer's view is unobtainable (30% obliques satisfactory). 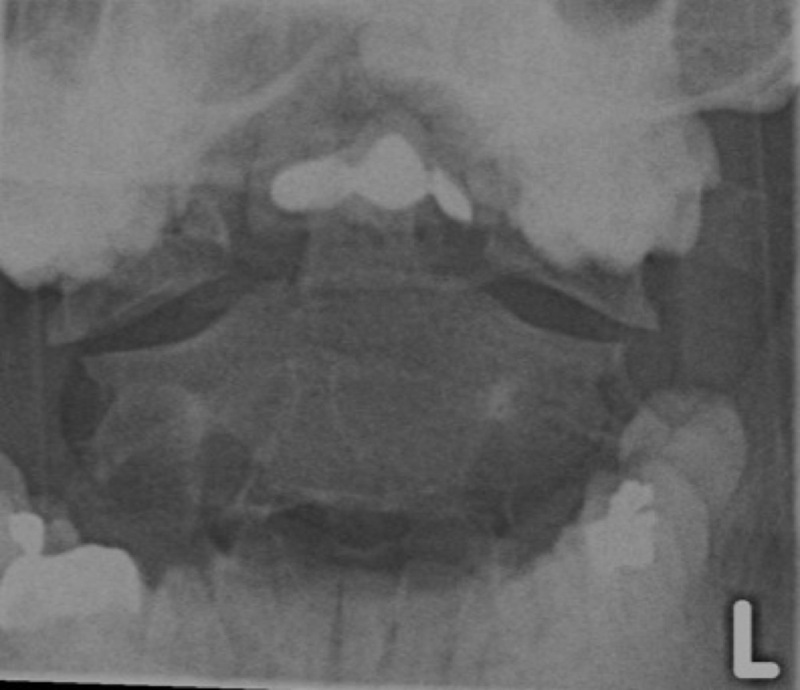 Right posterior oblique demonstrates the left foramina. 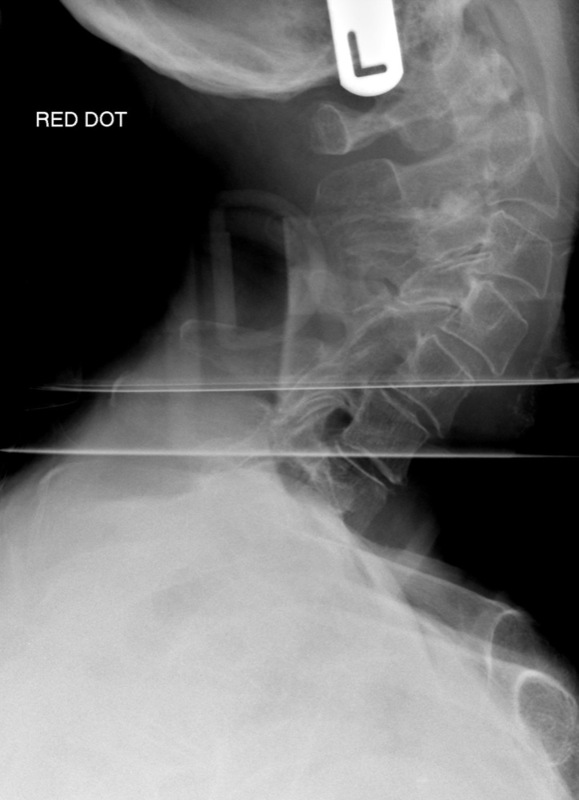 Right anterior oblique demonstrates the right foramina. To demonstrate ligament instability and subsequent vertebral mobility. 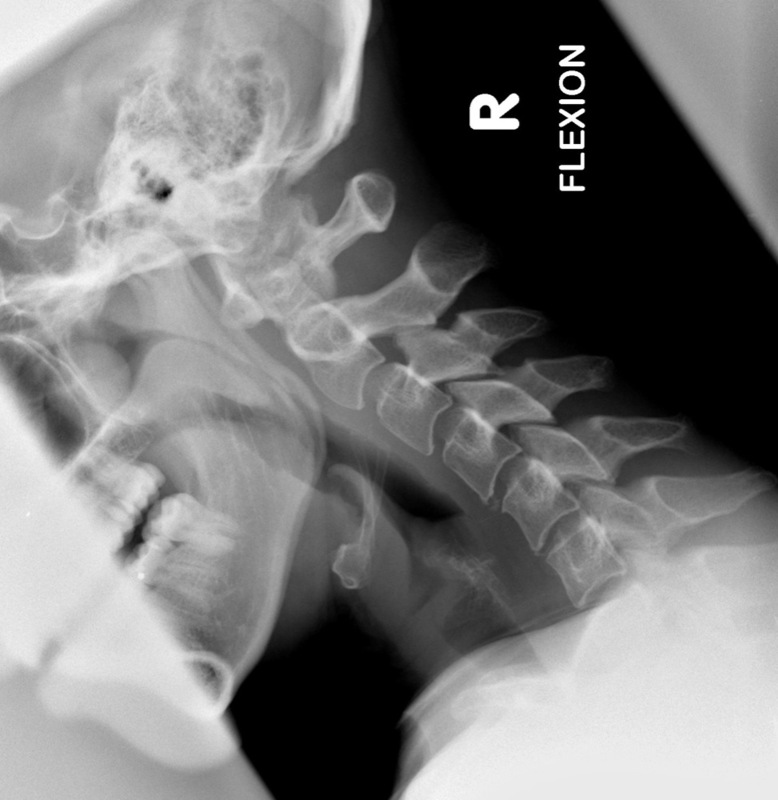 In the context of trauma, flexion and extension views are taken when there is mild mal-alignment on plain radiograph and index of suspicion is high for ligament rupture. This is a taut, strong structure that is closely applied to the anterior aspects of the vertebral bodies and the annulus of the intervertebral discs. This is weaker, and is attached to the posterior vertebral bodies and intervertebral discs. This ligament lines the dorsal surface of the spinal canal and is tightly applied to the laminae. These interconnect the spinous processes. 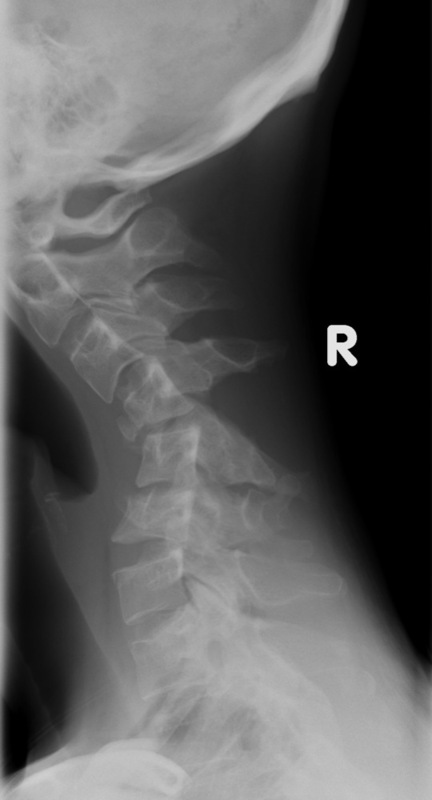 Is applied to the dorsal tip of the spinous processes, and overlies the interspinous ligaments. A central, gelatinous nucleus pulposus. Surrounding peripheral, concentric layers of annulus fibrosis. 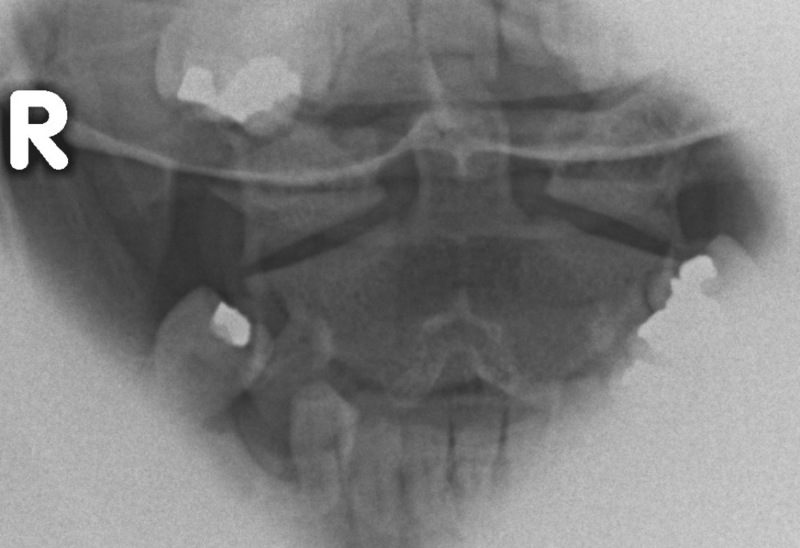 The normal anteroposterior diameter of the cervical spinal canal is approximately 10-20mm. 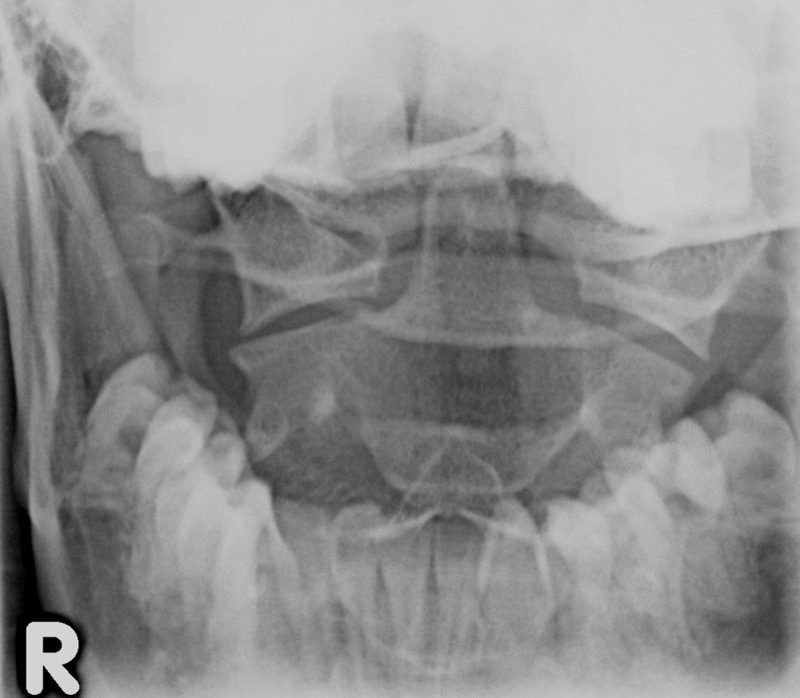 On the lateral radiograph it may be measured relative to the vertebral body - the two should be equal. 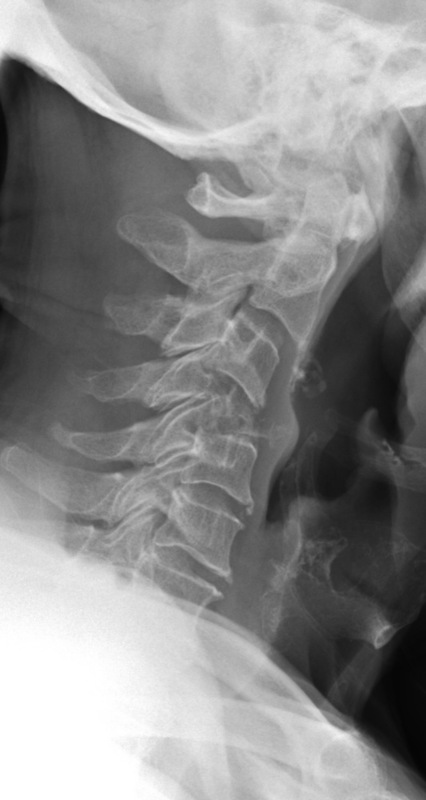 In the cervical spine region, the spinal cord occupies 50% of the spinal canal. 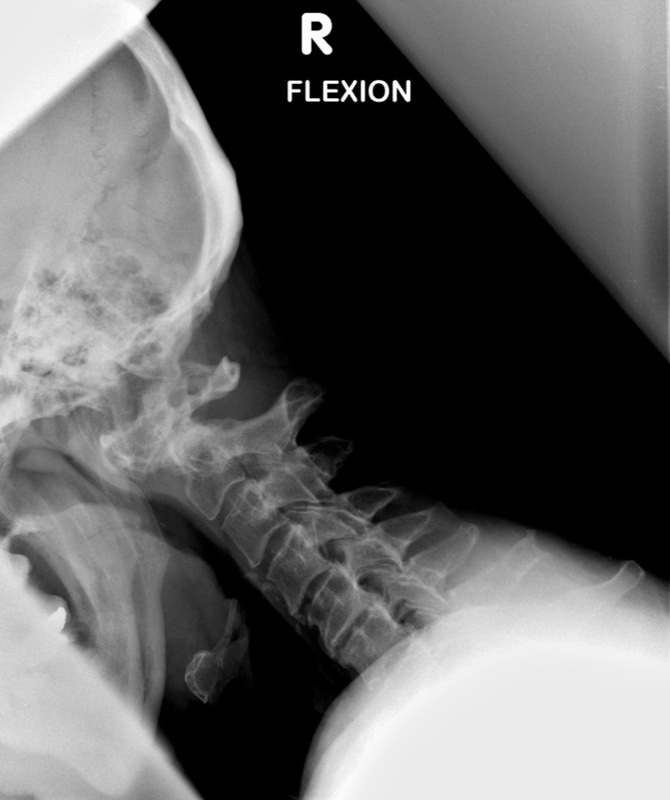 Up to 80% of all cervical spine injuries are due to hyperflexion. 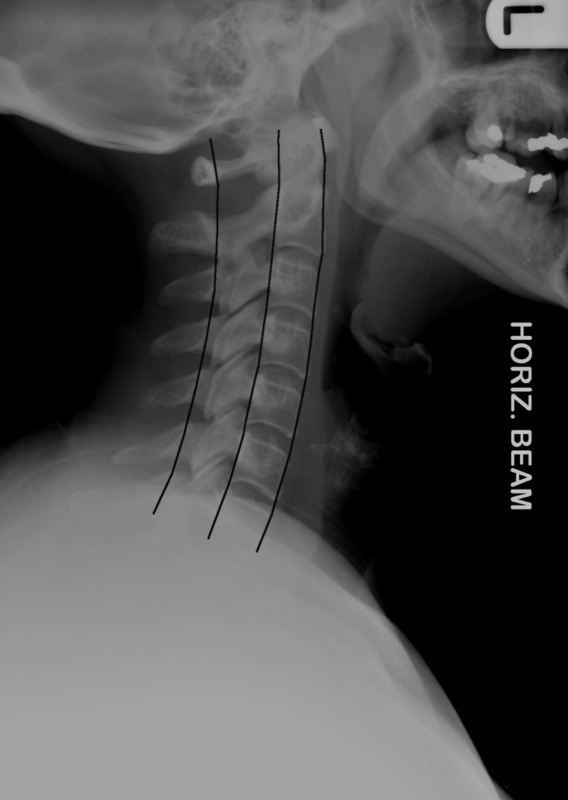 As the head is flexed, the maximum force is focused upon the bodies of C4-C7. 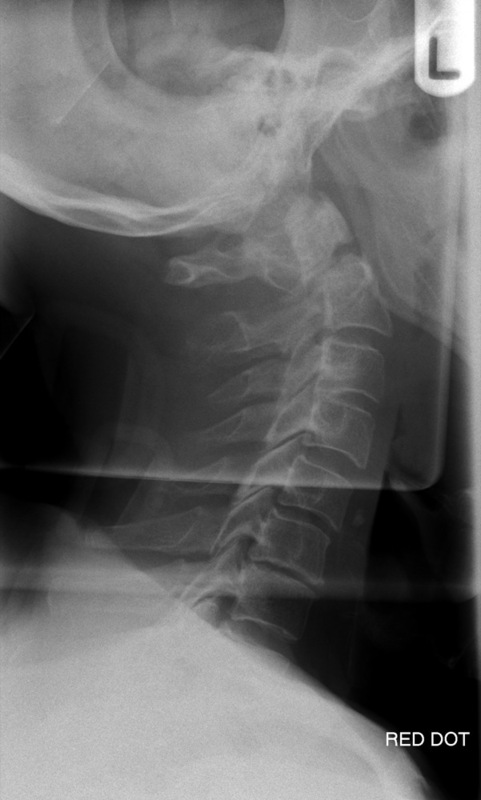 Compression of the vertebral body causes anterior wedging. The posterior elements - the spinous processes, laminae and supporting ligaments are placed in tension, which result in fractures and tears of these structures. Hyperextension creates tension in the anterior longitudinal ligament. This may tear at the intervertebral disc space or at the margin of the vertebral body. 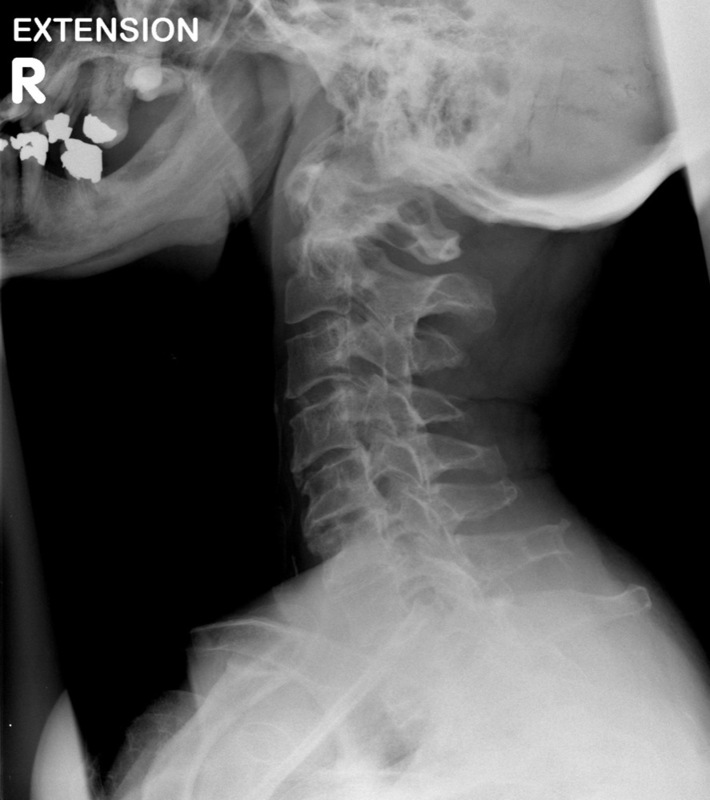 The latter results in an avulsion fracture of the anterior superior or inferior margin of the vertebral body. 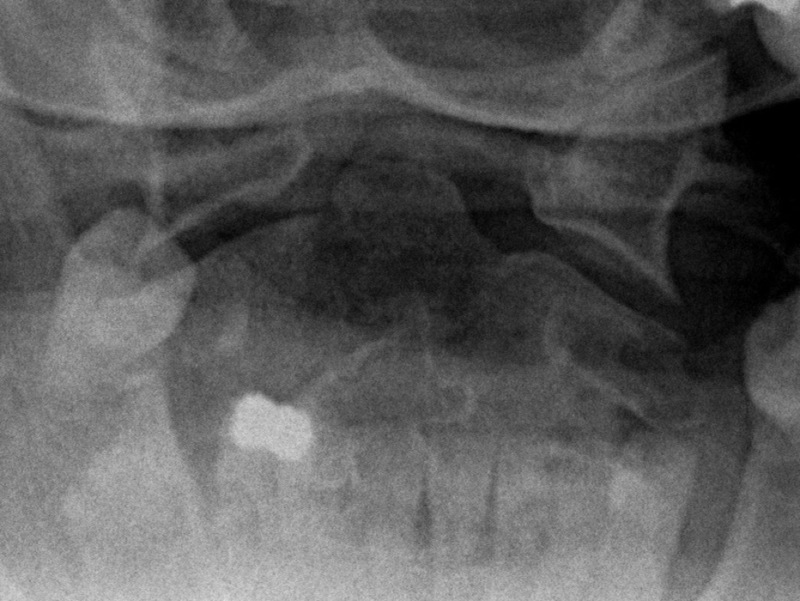 The posterior elements are simultaneously compressed, which may result in fractures of the spinous processes, laminae and facets. 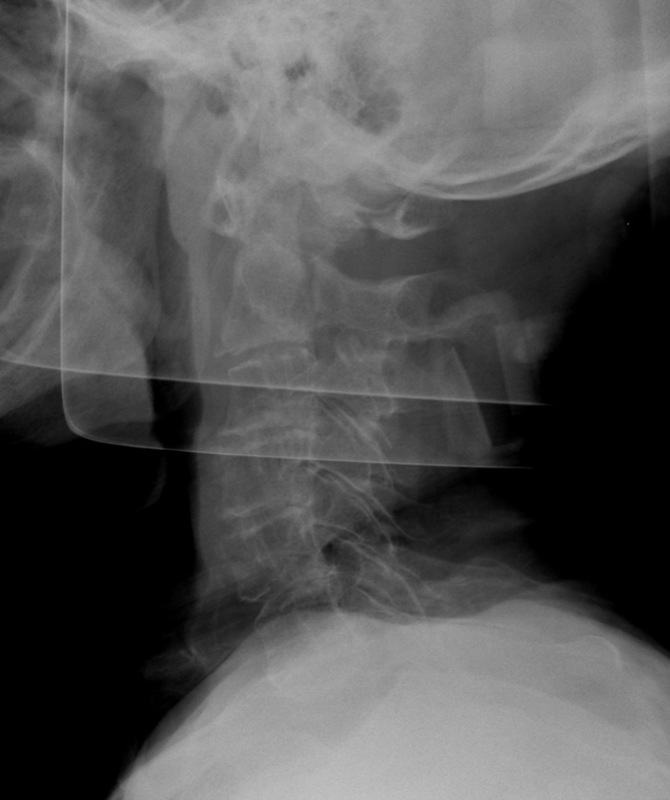 Initial trauma is to the vertebral endplates. 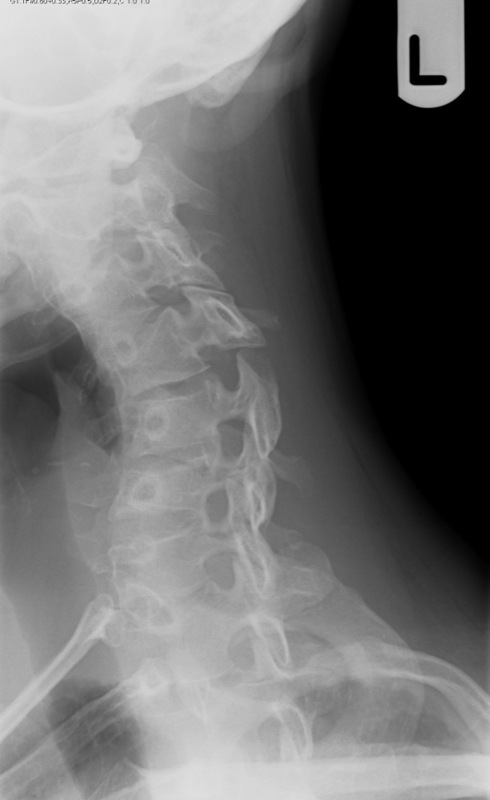 Increased compression causes the intervertebral disc to explode into the vertebral body. This creates a comminuted fracture. 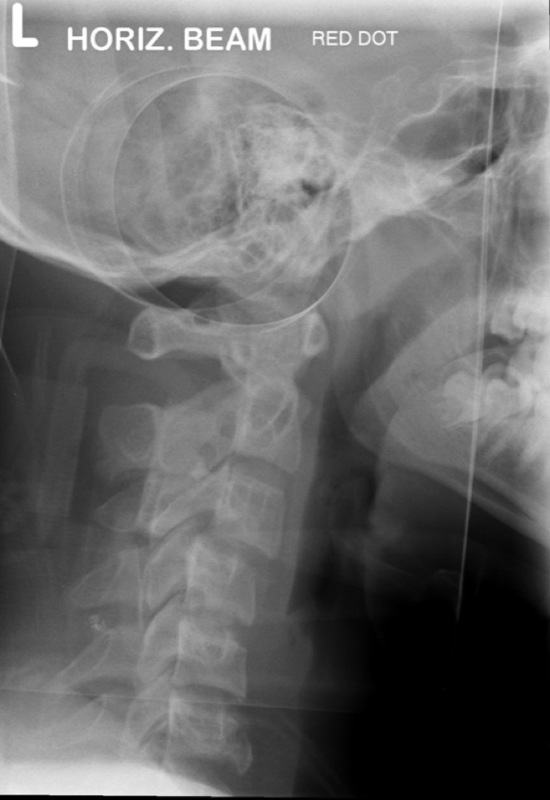 Movement of the head, which weighs approximately 10Ib, creates tensile forces on the cervical spine. If occuring in combination with flexion or extension, this lessens the severity of compression resulting from these forces. 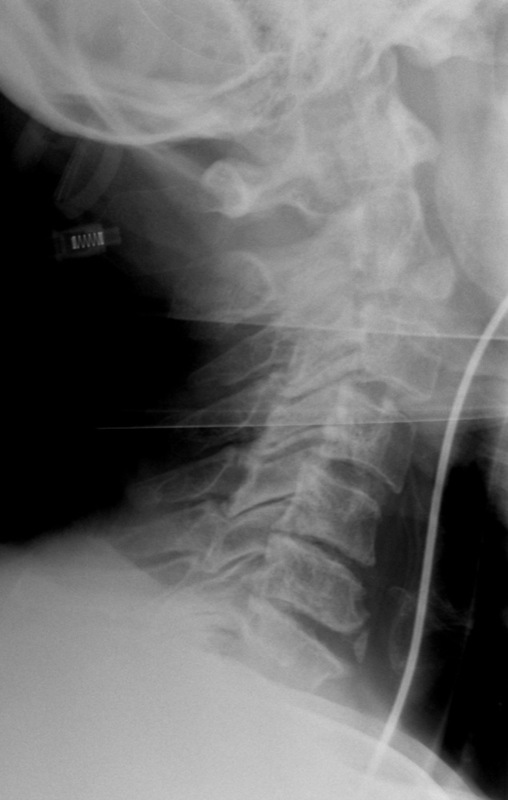 Osseous structure will be maintained, to the detriment of the interspinous ligaments. The spinal ligaments withstand compression and distraction forces well, but are very susceptible to disruption by rotation. 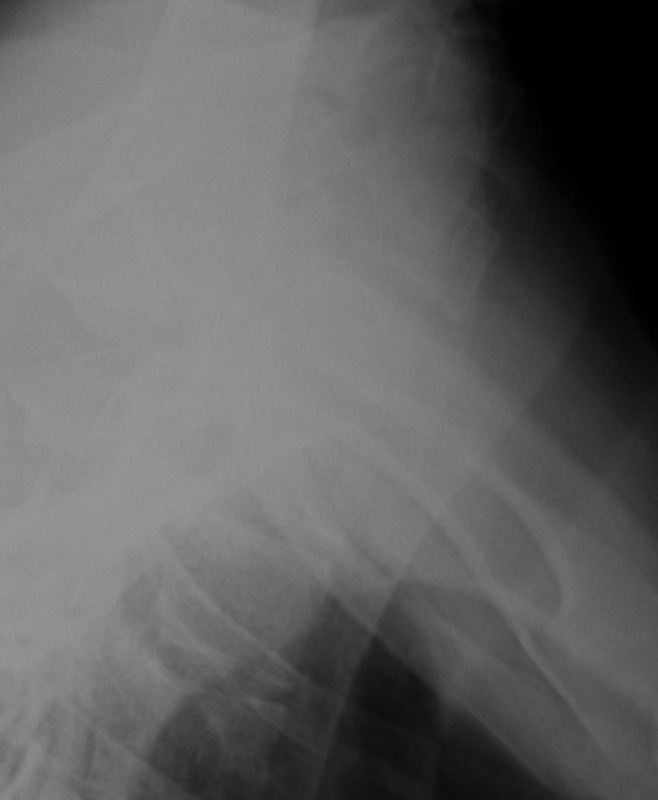 Results also in fractures of the posterior elements, particularly the facets and laminae, and in fracture - dislocations. Anterior column - Involves the anterior two thirds of the vertebral body/intervertebral disc, and the anterior longitudinal ligament. Middle column - Involves the posterior aspect of the vertebral body/intervertebral disc, and the posterior longitudinal ligament. Posterior column - Involves the posterior elements - the lamina, facet joints, spinous processes, and the associated ligaments. 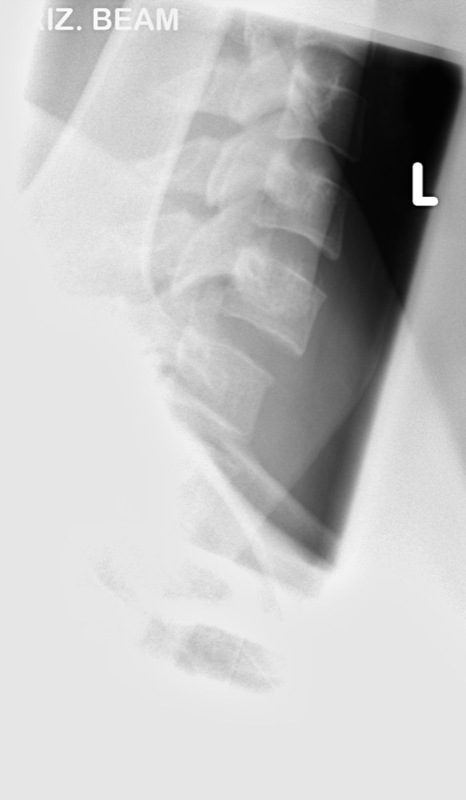 An injury to the spine is considered unstable if two of the three columns are disrupted. 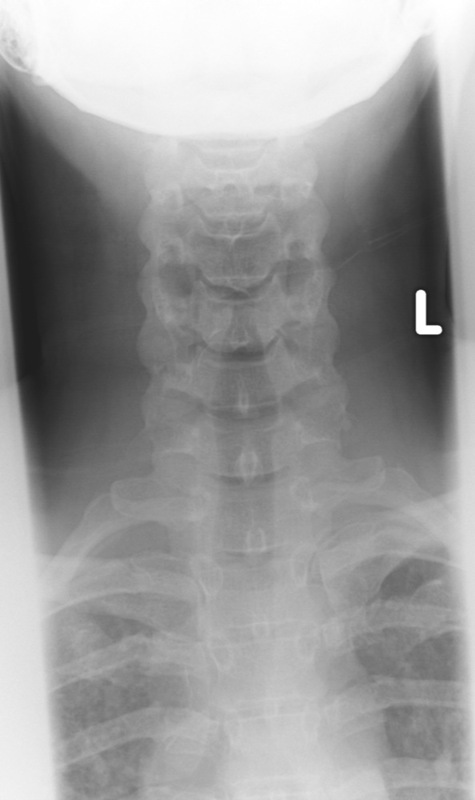 Generally, if the middle column is disrupted, either the anterior or posterior columns are also involved, and the injury is unstable. 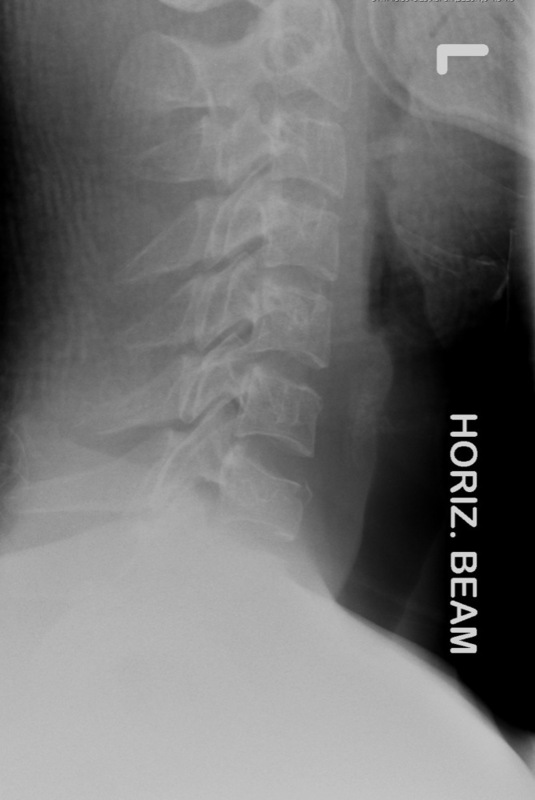 The middle column is the fulcrum from which the spine pivots into flexion and extension. It is generally thought that the middle column remains intact, and is therefore stable, in simple flexion and extension injuries. 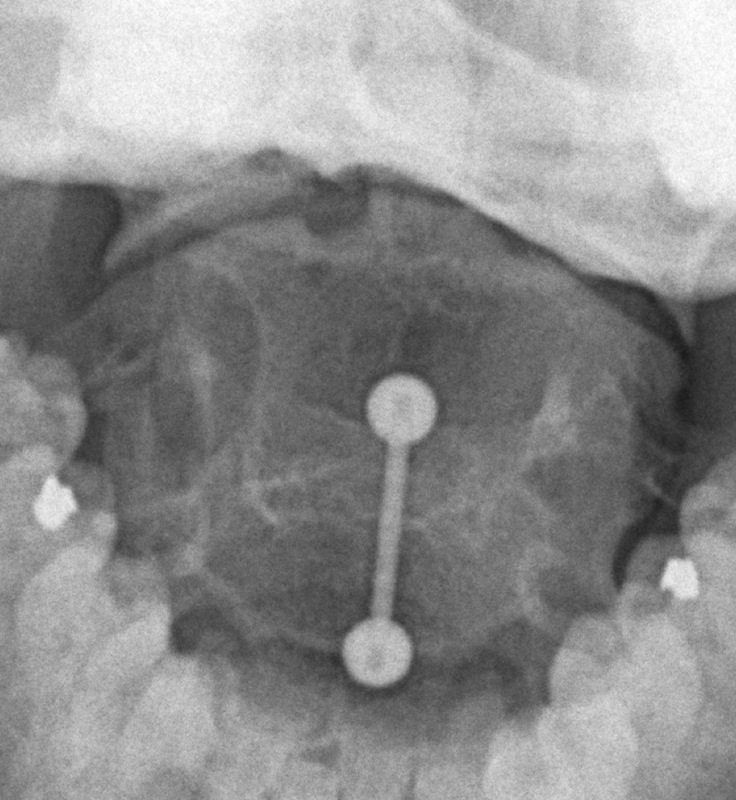 Axial compression, distraction and rotational injuries, or a combination of these with flexion or extension, usually disrupt the middle column. 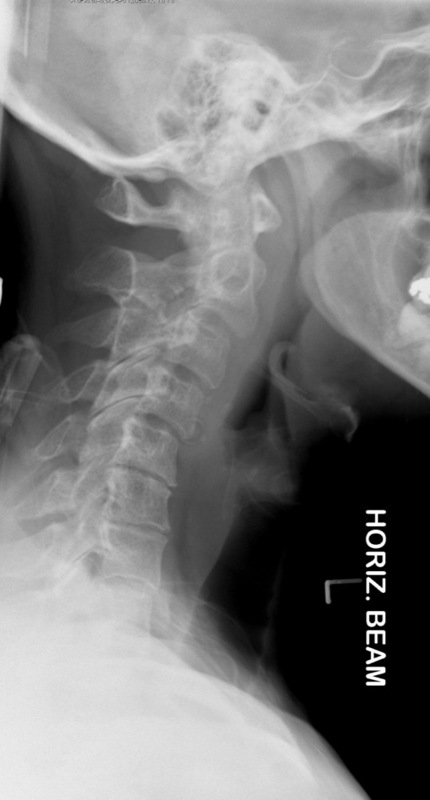 unilateral C1/C2 odontoid peg joint space widening. lateral masses of C1 overhang the lateral masses of C2. Caused by axial compression, the intervertebral disc is driven into the vertebral body below. 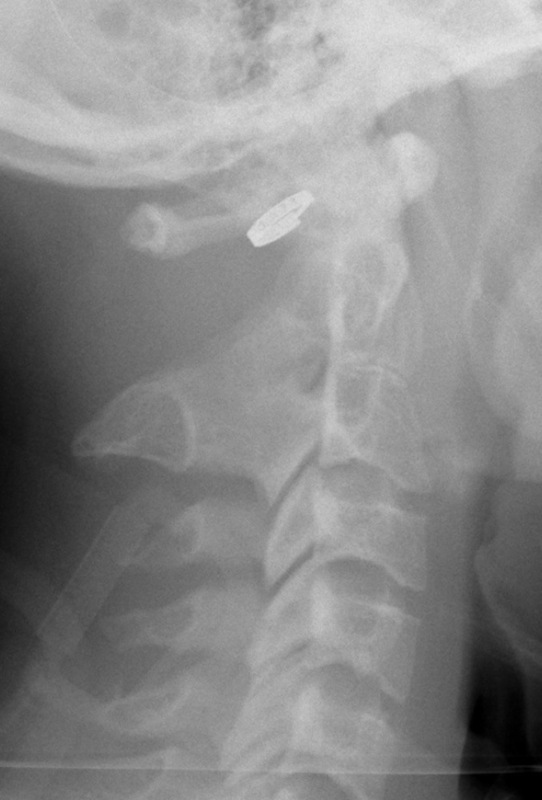 The vertebral body explodes into several fragments; a fragment from the postero-superior surface being driven posteriorly into the spinal canal. 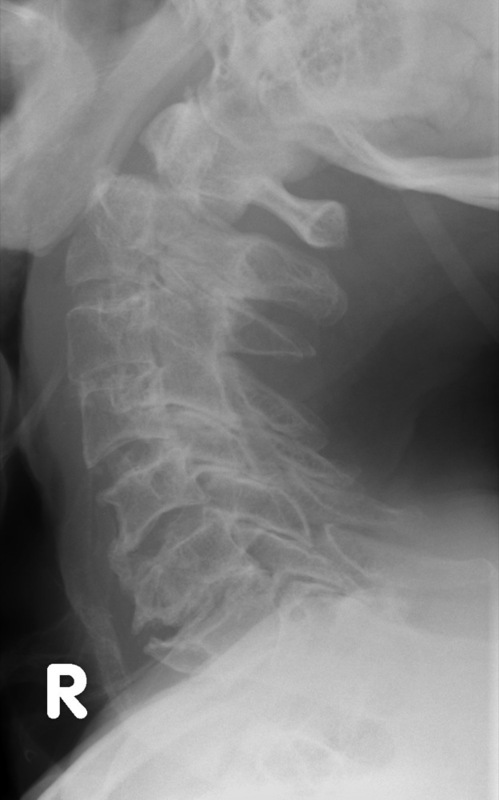 This is an unstable injury that frequently results in spinal cord injury. It is therefore important to check the posterior vertebral cortex for evidence of disruption, on an apparently simple wedge compression injury. Refers to soft tissue injury. Anterior subluxation occurs with disruption of the posterior longitudinal ligament, the interspinous ligament and the intervertebral disc. 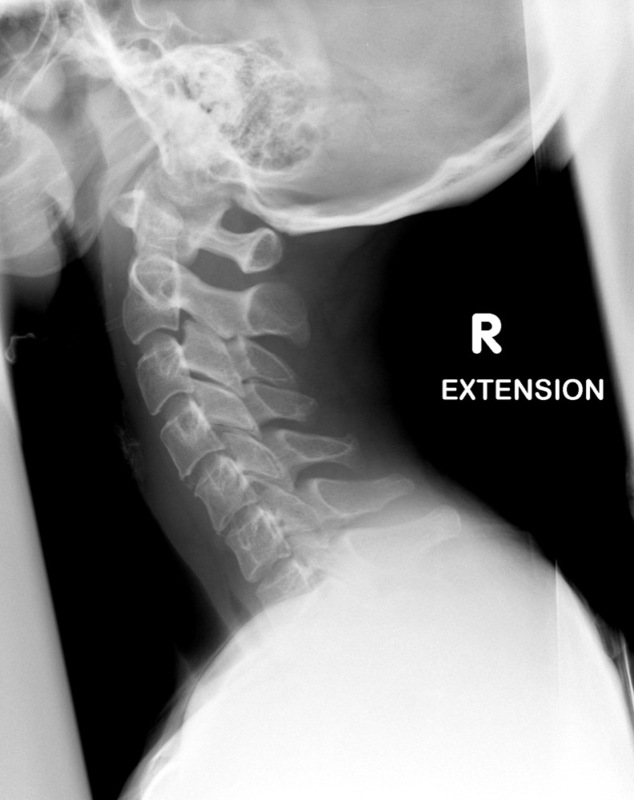 The lateral projection demonstrates localised kyphotic angulation with an increase in height of the intervertebral disc posteriorly and associated fanning of the spinous processes. 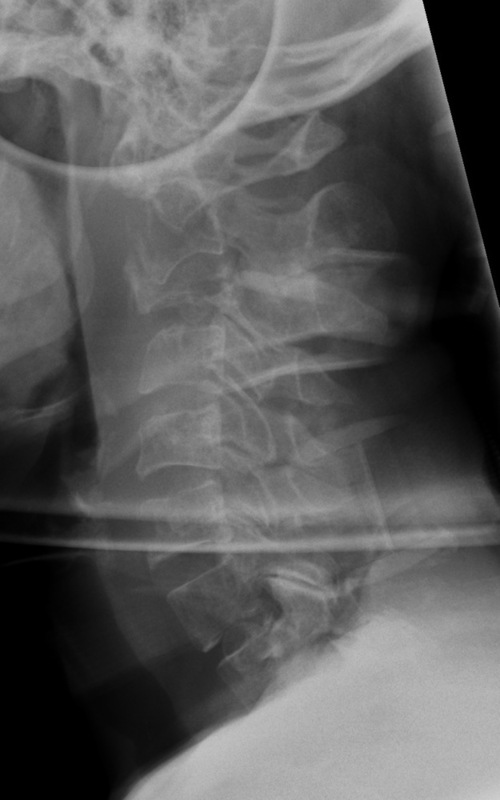 The converse of hyperflexion strain; the anterior longitudinal ligament is disrupted as evidenced by widening of the intervertebral disc space anteriorly. 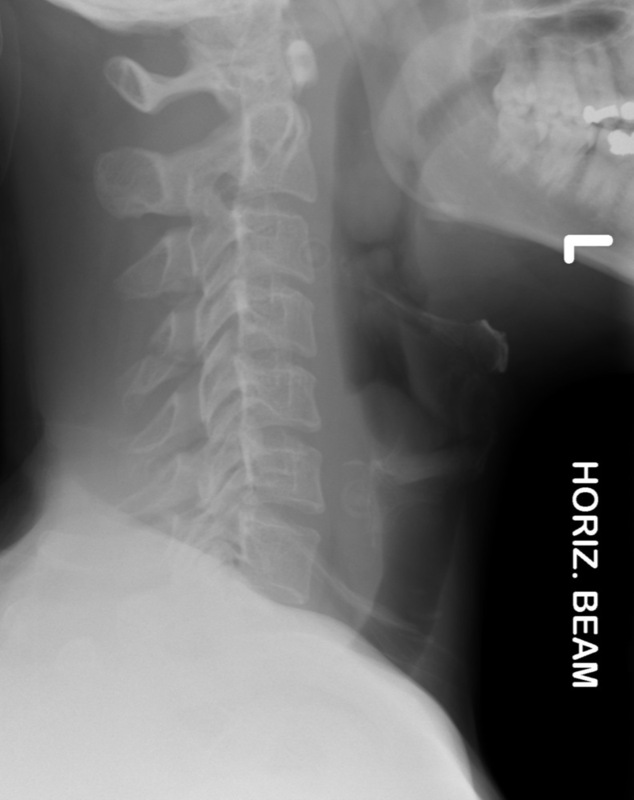 The facet joints are disrupted and the interspinous distance is narrowed.